There are a number of ways to save links from the web for later access, whether that’s marking articles to read later via apps like Instapaper or Pocket, pinning shopping inspiration to Pinterest, creating playlists on YouTube or even just using a browser’s bookmarking feature. But a new app called Stash, available for both iOS and Android, wants to offer a better link-saving service by making it easier to save, organize, search and share any content you find and want to keep. Unlike a simple bookmark manager, like those built into some web browsers, Stash has developed technology that will automatically categorize your links based on the type of content they include. That means instead of just saving articles to read later, for example, Stash can organize a range of items into their own categories, like places, books, recipes, files, movies, songs, videos, products and more. Stash also addresses other issues with some rival bookmarking services — moving content between devices and actually remembering to revisit the items you’ve saved at a later time. 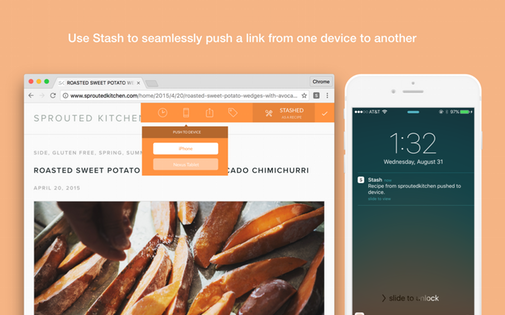 With Stash’s “push to device” feature, you can quickly send an article you’ve saved on the web to your smartphone, to your tablet or vice versa. Meanwhile, by enabling notifications, you can also choose to set alerts on individual items so that you’ll make time to return to them later. For instance, you could alert yourself on Sunday morning to read that long, multi-page feature article you didn’t have time for during the week. This is something that fans of “read it later”-style services will likely appreciate, as we all too often save web content for later perusal, but then promptly forget about it. The app itself is fairly simple to use, though it does have to walk you through a few steps during setup, like enabling access in iOS’s share sheet for use in your mobile applications, enabling notifications in the web browser via its Chrome extension or adding other devices to your account. Once set up, you can also search your saves in Stash using filters or share them with others via an “Inbox” feature, in addition to saving and sharing. Stash was developed by Cornell students Rahul Shah (CEO), Chris Goes (CTO) and Sachin Rudraraju (CPO) following a pivot from their earlier attempt at building analytics software for media publications called Speare. The classification technology they developed for Speare now powers Stash in order to automatically categorize and tag the web pages users save. That tech gets better over time, as more people use Stash, and correct its data. “We built Stash with the idea that there’s a lot of content on the web that we want to save, but current save-for-later services focus mainly on articles. There are also the songs we find on Soundcloud, the places we want to eat at on Yelp, the books we want to read on Goodreads — just to name a few,” explains Shah. “We wanted to build one place to store all of that information, while effortlessly keeping it organized,” he says. Of course, there have been a number of attempts at reinventing bookmarking over the years since the fall of top social bookmarking services like Delicious. Five years ago, for instance, a TechCrunch Disrupt Battlefield finalist, Spool, debuted its “Instapaper on steroids,” which let you save any content to its app, including not only text, but also media like audio and video. (Spool was later acqui-hired by Facebook). Facebook since launched its own “read it later” feature, with the launch of its Save button. Other apps like Kippt, Pinboard, Pearltrees, Clipix and more have also tackled bookmarking from various angles, while niche services have focused on verticals, like location, as with Soon, Grafetee, Mapstr and Matchbook, to name a few. None has ever had the breakout success that Delicious once had during the Web 2.0 heyday, which raises the question as to whether universal, smart bookmarking tools are in huge demand among today’s consumers. Stash is available as a free download and isn’t yet generating revenue. The company is backed by $20,000 in seed funding from Dorm Room Fund, as well as friends and family contributions.